The next number one actress on the way? 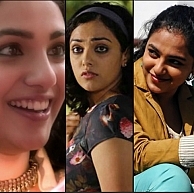 A name that rings a bell at every corner of South Indian film industry currently is Nithya Menen. With a cute smile and a bubbly physique, Nithya Menen has stolen the hearts of many. 2015 has been a lucky year for this beautiful actress as 7 of her films have already been released and most of them are doing good at the theaters. She is also working on other projects and has about 3 films lined up. Her journey of releases this year, started with Malli Malli Idi Rani Roju in Telugu directed by Kranthi Madhav which released in February, 2015. After this, the much talked about Cheran's JK Enum Nanbanin Vaazhkai was released in DVDs directly in the month of March, 2015. One of the awaited films in Malayalam was 100 Days of Love which released in April, that featured Nithya in the lead role alongside the current heartthrob Dulquer Salmaan. This film did fairly well amidst the Tamil Nadu crowd too. While all the promotions of OK Kanmani were happening, she had another film released in Telugu titled S/O Satyamurthy in the month of April which is a multi-starrer also featuring Allu Arjun, Upendra, Samantha Ruth Prabhu, Sneha, Adah Sharma, Rajendra Prasad, Brahmanandam and Ali. Following this, Kanchana 2, OK Kanmani and OK Bangaram released on the same day, April 17th which saw a wide reception among all centers of audience. Nithya made her presence felt in Kanchana 2 with a scoring role featuring Raghava Lawrence in the lead role. The very charming Nithya Menen was the actor in the lead role in OK Kanmani/OK Bangaram co-starring Dulquer Salmaan which is directed by Mani Ratnam and with music composed by AR Rahman. With a raving appreciation from everyone across South India for her acting in her recent films, one question that lingers in everyone's mind is, is Nithya Menen on the way to become number one actress in the south? We will wait and watch! Will Vishal recreate his magic with Paayum Puli? Dhanush has something special for someone! Will Vijay follow the happening trend? Masss - When will Venkat Prabhu oblige Suriya's request? Tamil Nadu box office - How has Mani Ratnam's OK Kanmani fared? Cheran's JK Enum Nanbanin Vaazhkai To Release Along With I And Yennai Arindhaal ! People looking for online information on 100 Days of Love, JK Enum Nanbanin Vaazhkai, Kanchana 2, Malli Malli Idi Rani Roju, Nithya Menen, OK Kanmani, So Satyamurthy will find this news story useful.